In June, I posted about a project that I am doing with a group of other educators. 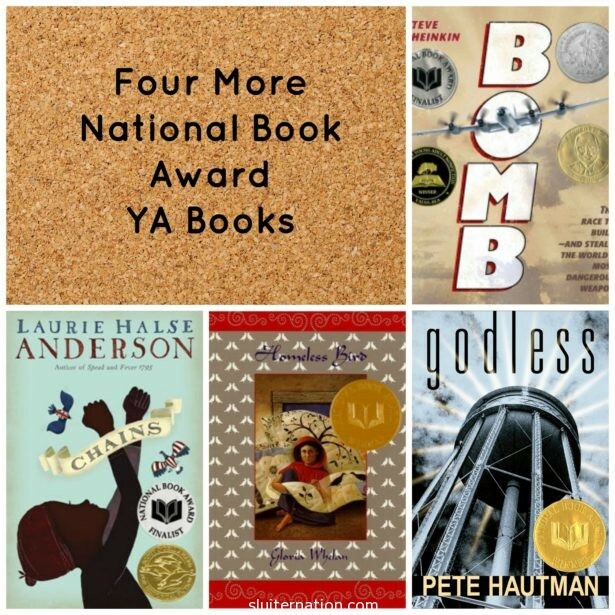 Dr. Steven Bickmore (you should go read his YA blog, by the way) gathered a bunch of us together to read all of the National Book Award winners and runners up since the award for YA turned twenty this year. We divided up the books by year (there are five books per year); my year was 1996 and I posted about those books here. We each chose a “winner” from our year to move on to the next round. I chose A Girl Named Disaster by Nancy Farmer (a finalist in 1996; the winner that year being Parrot in the Oven by Victor Martinez). Maybe it’s my historical fiction kick, but I really loved this book. In fact, this is tied for me with A Girl Named Disaster to move on to the next round. So what is the book about? Koly is only thirteen years old when her parents arrange a marriage for her. While an arranged marriage is typical in India, Koly’s takes a tragic turn and she is left to fend for herself in a large city. The book is a quick read and appeals to all levels. It’s set in India and asks the reader to wonder about family structures, cultures, and traditions while also addressing the idea that the individual does not have to fit a mold to be a happy part of society. While Homeless Bird was my favorite of the four new books I read, this was my least favorite. I wanted it to be my favorite. I wanted to fall into it and find a bit of myself in it. The book is narrated by teenager Jason Bock whose family is very Catholic. Jason identifies as a “agnostic-going-on-atheist”. His parents try to get him into the fold of religion by sending him to a class at church for teenagers to talk about issues. The class only solidifies Jason’s apathy toward organized religion. In a moment of boredom and, according to Jason, clarity, he decides to create his own religion–one that worships the town water tower. I really wanted this book to push the envelope and dig into the questions many teens have about religion and God. I was one of those teens and I craved books that showed others feeling and questioning as I did. This book fell short and only seemed to graze the surface. I was disappointed. This was another one that I loved. I almost put this as my vote to move on, but didn’t just because I think Homeless Bird appeals to a larger range of students than Chains does. Chains takes place just as the Revolutionary War is about to begin. Isabel is a 13-year old slave in Rhode Island whose mistress dies. She and her sister are to be freed according to their mistresses will, but that does not happen and she is sold to a cruel New York City couple who side with the King and not with the American Revolution. Isabel finds herself befriending a slave boy who works for the Rebels and delivers messages and makes other dangerous errands that could get her beat…or worse. This book was brilliant. It was long, and took a bit to get into, but the way Anderson wove both history and fiction together was flawless. Anderson has a follow up novel, Forge, and also a third, Ashes. I think students who love American History and have more reading stamina will fall in love with this series. I don’t read a lot of nonfiction and what I do read is usually memoir, and I definitely don’t read books about science, war, or bombs, so I waited to read this one until the very last. Where Godless disappointed me, this one thrilled me. Bomb is written as a narrative of how the nuclear bomb was imagined, theorized, tested, and finally created. It also weaves in Russia’s attempts to steal the bomb using primary source quotes from American and Russian spies. It’s a real-life story of war and espionage. While I know what happens in the end–we make the bomb before he Germans and bomb Japan–I was still on the edge of my seat for the personal stories of the scientists who worked on the bomb…and those who leaked information to the Russians. The photos throughout were also a wonderful addition to the book. I want a separate category for books like this, but I feel like maybe this is one of a kind. Overall I think the books I can see my 8th graders picking up and reading on their own are Homeless Bird and A Girl Named Disaster. Those are tied for me and I would be happy to move either on to the next round! I love your book recommendations and the way you inspire your students to read by walking the walk first. Examples set from the top down are the BEST.